Happy National S'mores Day! I'm usually not a fan of "made-up" or Hallmark holidays, but come on, a day dedicated to S'mores, who could argue with that? 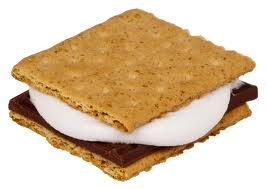 The recipe for S'mores first appeared in a Girl Scout publication in 1927. Go Girl Scouts! (See my earlier post on the 100th anniversary of Girl Scouts and all the good that they do.) Thanks to them, the combination of graham crackers, roasted marshmallows and chocolate has been delighting families for generations. So tonight, gather your loved ones and roast up some fun!